The Derek Gordon saga continues. The Grand Lodge of Arkansas has rescheduled Gordon’s Masonic trial but demanded he bring a copy of his military orders as proof he was performing duty for his country on the originally scheduled day. It promised Gordon that he would receive a new letter in the mail by Friday April 16, 2010, outlining charges and setting forth a new date. Friday April 16th has come and gone and Gordon has received no correspondence from the Grand Lodge of Arkansas. This follows a pattern set by the Grand Lodge in the proceedings against Gordon. Gordon never received the first letter notifying him of Masonic charges. As Secretary of the Lodge he never received any notifications of changes made at the 2010 Grand Session. He had to go out and find brothers who had that information available because materials were taken when the charter was arrested. Also, the Grand Lodge of Arkansas refused to provide that information to him. The 2010 data was sent just last week after finding someone who had a copy. I stand accused of “un-Masonic conduct” for reasons that the Grand Lodge of Arkansas refused to delineate. The Grand Inquisitor (Chairman, Grand Lodge Trial Commission), John Penrod, was kind enough to inform me that I must determine the causes of action the Grand Lodge of Arkansas has against me. And, the Inquisitor refused to provide materials that might shed light on such issues. Again after many attempts to reach the Grand Master by telephone Gordon finally is successful. He poses the same question. Please be specific and tell me where, when and how I have violated 4.0.61. The Grand Master refuses to answer. The Grand Master demanded that he come to the trial and answer all of their questions. At that time he would find out the details. Now if you know Masonic procedure and basic legal procedure and civil rights, not to mention common decency, you know right away that the Grand Lodge of Arkansas is not handling this process correctly. Perhaps GL of Ark. needs a course in basic civics. Gordon thought at first that he was being charged with violation of a brand new Grand Lodge ruling made in the 2010 Grand Session because that is what Sebastian Lodge #706 was charged with. The sequence of events and their close proximity to their execution hold the whole Grand Lodge process in suspect. 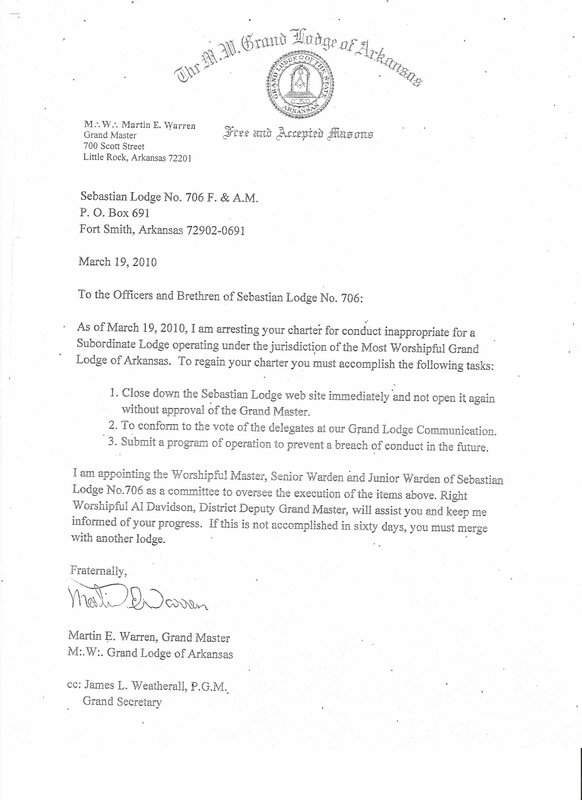 First you had webmaster Gordon posting the Grand Master’s directive prohibiting the purchase of Arkansas Masonic license plates on Sebastian Lodge’s website with provision that this was not necessarily the point of view of Sebastian Lodge. Just a few days, literally 3 days, later Grand Session convenes and a new anti electronic law is passed followed by in just a few more weeks until the closing of Sebastian Lodge by the Grand Master and the initiation of charges against Gordon. A good case could be made that the Grand Lodge of Arkansas instituted the new legislation for the sole purpose of expelling Derek Gordon. The Grand Master uses this new law to pull the charter of Sebastian Lodge and close it down. What is on Sebastian’s website has been put there by Gordon. So it is only natural for him to initially think that the charge is related to the posting of Masonic information for public view. But Gordon is able to demonstrate that all that he has posted on Sebastian’s website he has drawn from the Grand Lodge website and other chartered Lodges of Arkansas linked on the Grand Lodge website. And to further weaken the validity of its position the Grand Lodge of Arkansas is prosecuting, using a brand new law, before it has informed all its constituent Lodges that the new law was made. Sebastian Lodge receives the notification of the anti electronic communication addition to Grand Lodge’s by-laws along with the letter of charges filed against Gordon and a Masonic trial date all at the same time. That means that the Grand Lodge is proceeding against violators of its new law before anybody has been notified that the new law exists. That fact strengthens the position that the only reason they created the new law was to prosecute Gordon. Gordon searches for another reason the Grand Lodge might be prosecuting him and remembers associating with Black Masons at Mainstream Lodges in Oklahoma and Prince Hall Masons in the military service. Since he has so informed Grand Lodge of these activities and suggested to Grand Lodge to pursue Prince Hall recognition he wonders if this is the real reason for charges being filed against him. The Grand Lodge of Arkansas proudly announces its purge of others also. There are other more overriding issues here. It is not just about racism, although that surely is a component. It’s just as much about the abuse of power, un-Masonic conduct by Grand Masters and Grand Lodges, in short tyrannical leadership. From the earliest of Speculative Masonic ages the Royal Society and Freemasonry were connected. From 1640 into its formal formation in 1660 Freemasons like Elias Ashmole, Sir Christopher Wren, Sir Robert Moray and Dr. Desaguliers brought the Royal Society and Freemasonry together in the pursuit of light. Free thinkers, leaders in the arts and sciences, political and societal action in behalf of the worth of the individual, the philosophy of the Enlightenment all characterized what Freemasonry was all about and its unique ability to harmonize many diverse elements in one body under one roof. But as practiced in America, many Grand Lodges are no longer receptive and accepting of different opinions, practices and lifestyles. They are exclusionary not only purging Blacks, Jews and Catholics but casting out anybody who wishes to think for themselves. Some Mainstream American Grand Lodges refuse to allow a Master Mason in their jurisdiction to express what Freemasonry means to them, to talk about Freemasonry or to think for themselves. They demand that their Brethren shut up and let the Grand Lodge do their thinking for them. They squash openness and reforms at every opportunity they get. The power that American Mainstream Grand Lodges possess today is far stronger than 50 years ago. Before 1960 Grand Lodges were more like equal partners with their chartered local Lodges. The Local Lodge and its Worshipful Master stood supreme in the governance of its own affairs. Oh, yes there were Grand Lodge requirements, Grand Lodge forms to fill out and send in and a Grand Constitution to uphold. But rarely did a Grand Lodge attempt to mess in the affairs of a chartered Lodge under its jurisdiction. The Worshipful Master was supreme in his own Lodge and the Grand Lodge handled affairs on a District or state level while also offering advice and help when a local Lodge asked for it. The 1960’s saw American Masonic membership take a nosedive. In response to what Grand Lodges saw as the sluggishness of its constituent Lodges to take the necessary measures to boost membership, Grand Lodges jumped in and began making demands on subordinate Lodges. Grand Lodges made the case that only they could, by pooling resources, initiate large expensive programs to attract new members. They used this excuse to then make more demands on local Lodges and take over some of their Lodge’s decision making. The result of this power shift also had a profound influence on the financial well being of local Lodges. As Grand Lodges assumed more and more power they not only were able to reap the rewards of giant, state-wide fundraisers which only they could afford to finance but also financial backing, donations and gifts bypassed local Lodges and went directly to the coffers of Grand Lodges. Subordinate lodges became more and more financially strapped and Grand Lodges refused to send any money back down to them. As local Lodges pleaded for financial help, Grand Lodges would only provide help with strings attached. Those strings enabled them to make decisions in local Lodges that in days past would never have been allowed. There is an old saying that power corrupts and absolute power corrupts absolutely. Now Grand Masters always have had supreme power, but the boundary line of their duty was always spelled out so that there were many avenues that were off limits to them. Once any limits to Grand Lodge power were eliminated it paved the way for a small Oligarchy to control a whole jurisdiction. 1) The Grand Master of West Virginia expels Past Grand Master, Frank Haas without a trial, for his reforms and policies while he was Grand Master. The Grand Master calls Frank Haas a few days before his Lodge’s Communication and asks him if he will be attending as he is going to visit the Lodge, but he gives no hint as to the nature of his visit. Then before Brothers and friends he blindsides Hass with an expulsion by edict. This Grand Lodge prohibits any discourse with “clandestine” Masons. If you can’t even speak with Prince Hall Masons it makes it pretty hard to start the process of recognition. But what is most distressing about this Grand Lodge is not just its racism but its ability to stop Master Masons from speaking out or discussing any Masonic matter. 2) The Grand Lodge of Georgia through devious means convinces two Worshipful Masters to prefer charges against Gate City Lodge and its Worshipful Master for raising a black man in direct violation of the Grand Lodge statue that says non whites cannot become members. This method demands a Grand Lodge trial and bypasses the local Lodge handling of this affair. It also shields the Grand Master from direct involvement in taking this action. Eventually the charges were dropped after Gate City Lodge sued the Grand Lodge in civil court. This brings us to the present state of affairs in Arkansas. The Grand Lodge of Arkansas is bringing Derek Gordon to trial and possible expulsion, but they refuse to be specific about what he has done wrong. In so doing they follow a pattern illustrated by Georgia, West Virginia and a host of others before them. The pattern may involve racism and, also, cultural and religious discrimination all of which are abhorrent and un-Masonic. Yet the overriding ability to act in such an un-Masonic manner can be laid at the bed of the enormous all-pervasive power Grand Lodges have assumed. Organizing and creating a group, club or organization of Masons outside of Lodge Communications for whatever purpose without the approval of the Grand Master is strictly prohibited. Writing and publishing Masonic articles, papers or books that haven’t been first approved by Grand Lodge is disallowed. Submitting to an interview by the press or going on a radio or TV show dealing with Masonic matters must have prior Grand Lodge approval. The theme that runs through all this is fascism which is anathema to Masonic tradition. Those members of the Royal Society who were also Masons centuries ago were not stopped from speaking their mind. Freemasonry has always prided itself on being inclusive, not exclusionary, of permitting differences in all aspects of society to co-exist in a big tent philosophy. Some of the great free thinkers of the world, some of the greatest mystics, some of the greatest spiritualists, many of whom were never conformists, were Masons and were never expelled for their views. Here is another way in which the Grand Lodge of Arkansas wants to cement its control as was passed in the 2010 session. Is ethnic (or individual) cleansing a permissible Masonic policy? Should any racism be tolerated in a Masonic jurisdiction? Do we all live on a Masonic island or is American Masonry all interconnected? American Freemasonry has failed Derek Gordon. There are too many Neros in American Freemasonry who will fiddle while Masonry burns. If you want to help Gordon don’t write to him or waste your time addressing the Grand Lodge of Arkansas. Write, call, E-Mail your own Grand Lodge and ask them to put a stop to this kind of Freemasonry. I took an oath though. I cannot think or act for myself. remember Halcyon ran into the GLoOH who refuse Logic and acted on Passions and were found to be out of line, not the Free Thinking masons of Halcyon. How American Freemasons can be so timid and afraid of little men with big ego’s!? Start taking stands and the world will not end. Harmony being the strength of all institutions. However, harmony doesn’t even IMPLY blind agreement. Where does WHISPERING correction in our brother’s ear come in? I’m not sure why the same information is being re-hashed here once again? We’ve read all this already except for the news on a new trial date. Marc I agree a lot of it is rehashed. This does have new inclusions via letters and some snippets from what appears to be Grand Lodge announcements dispersed by Arkansas. Maybe the article is trying to speak towards the general problem with some Grand Lodges and their treatment of members while using a current ongoing story to outline that? At least half of it speaks to what several Grand Lodges including Arkansas have been doing and acting rather than Bro. Dereks own problem. I think the inclusion of Bro. Derek again is illustrating the rest of the articles point. Gordon should stand down and stop stirring up trouble. Surely Freemasonry’s aim is worldwide pursuit of “Brotherly Love, Relief and Truth”. I am sure that whether you be Black/White or what ever colour, if these are you main aims, then so what. I think its very bad that the Grand Lodge of Arkansas will not inform our Brother of what ‘crime’ he has supposed to have commited prior to his ‘trial’. They are hiding something. I offer my hand to any Brother no matter what Grand Lodge he belongs to. Grogan my man how are you? How are you and Grand Master Warren doing? The weather treating you both nicely out in Heber Springs? The word is you are going to be on Gordons trial commission. Try not to act un-Masonic like you have with the other cronies. 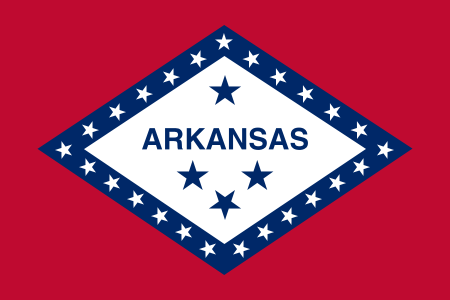 Arkansas needs to reform and become more open and honest with its membership. I cant believe you still are doing this crap years later. Stand down you say. Boy I remember the many Masons you all threw out even when by-laws were not broken. You guys were sure happy then. Remember when you all were so happy because Doug Simmons and the rest of the group were able to expel some members? You all kept bragging happily and admitting that NO by-laws were broken and that these men had no technical justification for expulsion? But you all did expelled them anyway? Oh those were such great times Grogan. Please let us keep on abusing the Masonic ways of life. James Grogan resides on Ferguson Rd, Heber Springs, AR according to Google. The Grand Master resides on Ridgecrest Rd, Heber Springs, AR according to the ARGL. Hey now I bet there is a resemblance here. Are we to see that a lodge buddy of the GM is now involving himself in electronic discourse. I do believe I see another person to be expelled in Arkansas unless their friendship and underworkings is enough to protect James. James this article was not by “Gordon” but revolves around a general perception so I wonder if ARGL will cease in its attempts to destroy someone who did not fit the “Worship the Most Worshipful ARGL” mentality? I saw another article about “Gordon” donated his phone record showing the MANY attempts to resolve this manner in a professional manner before he allowed his story to go public. SO if anything it appears he was doing his duty and ARGL refused to assent to its responsibilities. No wonder ARGL is losing in the younger generations. Somewhere it was mentioned that your membership went from 60000 to around 15000. Do these actions help I doubt that. Ms. Hall lossing a brother like Bro. Gordon is no loss at all. Gee, I wonder why people look at Arkansans like draconian racists. Perhaps it’s because they ARE. This doesn’t even seem to be a issue. If you break GL rules new or old you pay the consequences. What is it with guys trying to “RUIN” the Fraternity. Why are you trying to bring the same diseased social elements into the Lodge. Why must we, continue to lower standards, counter our values, ruin our ritual, dress like slobs, let in anyone who wants in, play rock/pop/country music 🙁 at a gentlemans banquet or dinner ballroom dance, rid ourselves of gentlemanly behavior, knowingly allow men who are counter our values & beliefs to join, continue the current lack of benevolence, continue the current unfraternal behavior towards members. I could go on and on. What we need is restoration getting back to what we are supposed to be doing, being fraternal towards our members(not suing members, Lodges, or GL’s ), Masonic education, esoteric education, restoring rituals, and gentlemanly activities. Like the invisible sign says, leave your politics at the door. That also means leaving Lodge politics inside the door. I wanted to move over a comment posted by Bro Wilson Curtis that has in it some question I and some other Brothers would like to see Bro. Derek address. I will continue to move this until Bro. Derek addresses them. I moved it over to Bro. Derek’s page where he has a place to put comments however he never posted them nor answered them. He wants everyone to feel sorry for him and he is letting The Most Honorable Frederic Milliken fight his battles on this website. Bro. Derek you have taken our Lodge away and I will have to go to Lodge with the other Lodge in our building but I want back MY LODGE 706. You have always had a great amout of fight in you, like when you had us move out of the temple. Get out from behind others and address the questions!! Tell all Masons what is really going on here! 1.Are we talking about the same MWGM or are there two different ones? Who has done what? 2.Where there any meetings with the MWGM held at Lodge 706 about this matter? How many? Were you asked to attend? Did you? 3.How can the “Mainstream” Masons have a race issue when there are black members in their lodges? 4.Jaye says, Rumor has it, and this has been mentioned to me by many many Arkansas and Oklahoma Masons, that a PGM of ARGL walked out of a meeting with the GM in OKGL because the meeting included “black masons.” I was at that meeting and it DID NOT HAPPEN. Were you there Jaye? 5.Bro. Derek has the MWGM expelled you from the Masons (which he has the right to do) or are you going on Masonic Trial to answer the charge against you? 6.Bro Derek why are you still pushing the license plate debate when those are not the charge against you? 8.Were the other lodges not punished because they removed anything they were asked to remove in a timely manner? 9.Bro. Derek when were you asked to pull down Lodge 706’s website by the ARGL? 10.Bro Derek you said you feel that your trial was deliberately set on a day you have maneuvers. Isn’t that speculation on your part? 11.Lastly Bro. Derek do you fell as though you have broken any other Masonic Rules? Look at the above letter; are you following the Rule voted on by your Manson Brothers at GL banning any and all Masonic electronic transmissions? You are not being brought to trial on those charges but you have most defiantly violated that rule now. It seems Bro. Derek has spent alot of time he says talking to the Grand Master (though he stated before The Grand Master had not spoken to him)though how can he not even know his name?? Bro. Derek you have an ax to grind and you believe that if you are going down you are going to take the GL of AR with you as well as Grand Master “Warren Martin.” The Masons have been around for thousands of years. You have tried to lead the good Brothers on this site to accept the false claims you are making. I am upset that I now belong to a Lodge without a charter because of YOU. You are trying to try your case here on the web but it is not these good Brothers who will set in judgement of you but your AR brothren at the GL. You might have gotten off with a slap on the hand but you have gone too far with these desortations. My wish is that the GL AR remove anyone who does harm to our craft and MY LODGE! Hey Jr.! The correct spelling is where not were. I have confirmed that no Sebastian Lodge members were ever at the meeting between OKGL and ARGL. So one of those questions you poised contradicts other things that you two usernames have been saying. I appreciate your deep questioning of my Masonic background. I see no reason why Arkansas Grand Lodge officials (that includes Past Officials) should go after me. But of course you all go after anyone who stands up against you. But I have nothing to say that I have not said before so I will not waste others time like you continue to do. Your LEGITIMATE questions were addressed. You are very good at threats and innuendos. When someone makes a comment you don’t like you bring up their internet connections or their address etc… Can you smell the fear that is in this site. Why try to discredit, facts should speak louder than lies. You investigations of me are so incorrect, it’s almost funny but really sad. Have you spoken to Bro. Derek lately? He has been AWOL since April the 18th. Cat’s got his fingers? No blog, no news letters, no more poor little mistreated weekend warrior ??? (Unlike some of us who put our life on the line in real combat! Ever been perpetually wet for days in a jungle? It‘s not maneuvers son!) How many good men and Brothers have you and Bro. Derek slandered or made to feel as if they had done something wrong? The above questions have not been answered in anything I have read. Why do you persist in trying to make this issue about race when it is not? Are any of the GL charges on Bro. Derek about RACE? NO!!!! What are his charges?? They were in the letter he so boldly posted on site after site? Ask him and get back with us or maybe he will rehash it again for all to see here “least we forget”. Then get over yourself! I am sure that many men and women would love to know that they are only weekend warriors and that means they never serve. I recently left the “weekend warrior” Army. I was deployed over a year. But that is not important to you. You said before Derek should not be doing anything because he cannot have the time being in law school. Might think finals are nearing maybe he is studying? I grabbed a package off of the “weekend warriors” doorstep yesterday. I heard he was called in to do take care of military stuff. But none of the above is of importance because as you have said he doesn’t tell the truth and lies about taking trips. And you based on him not posting photos of his trip on his website? Or your accusations that if he posts photos they will be forged because he lived in Peru a few years ago? Again you are not helping the cause whatsoever. Please elaborate why you all at ARGL have continued to ignore phone calls, evidence, and letters sent by the accused. Since he is guilty as you continue to say at least enlighten us your holiness. You act like the young brother is the villain without showing why ARGL has done what it has done. Actually we have invited that information before so I doubt that it will come. Have a wonderful day. I am on the opinion that this is the first time any abused brother in Arkansas has ever had the courage and fortitude to call ARGL out on the matter. That is the root of your hostility because you can no longer protect your interests with connections. The internet is too far out of your grasp. From what I have understood, the young brother called and left messages with your Grand Master and his wife. Call and ask the Grand Master why he never returned the phone calls when the young brother attempted to resolve the matter before it became wide spread? Or call the Grand Secretary and determine why attempts to make contact through the office were unsuccessful? You continue to direct all hostility at a young brother rather than accept a chunk for yourselves. That shows that ARGL is out of touch with reality. Being Bro Derek’s neighbor and of a different racial background I find it funny to think that he would be racist. How could the ARGL go after a person of a different race? We all know that there are no people of different races in the AR mainstream Masons! Right! How could the ARGL go after a person who lives in OK? How could the ARGL go after a PH Mason? You take a lot on hearsay or are you a member of Lodge 706 standing up for a buddy and championing his cause “sacrificing himself on the alter of “racism” to save face and trying to help him get on in another Lodge after his trial? Has any other Lodge ask Bro. Derek petition? What did you say about “LIES”? People who live in glass houses should not throw stones! REMEMBER THE TRUTH WILL SET YOU FREE!! Those are questions you will have to ask the GL? I am in NO WAY part of the GL now nor in the past! SORRY wrong again!!! Just wondering why should the GM be at his beckon call? He is not handling the case personally. He is over an entire state on just Derek Gordon. Derek said it was turn over to someone else. You keep hammering our GM like you know him. Do you? He didn’t write the letter about the plates. He has never brought up anything about the PH plates in anything posted. Bro. Derek is the one bring up that up. Hey why did he make all those calls before March the 17th??? The young brother is and has been attempting to avert the real charges against him and make it about race when it is NOT!! He has the letter with the charges on it! He has posted it. WHAT ELSE DOES HE NEED!! !Everything he has written is speculation and conjecture. (guesswork: the formation of judgments or opinions on the basis of incomplete or inconclusive information)The entire handshake story total CONJECTURE!! The letter is everywhere for everyone to see it is very plain!! You can’t twist it into something it is not no matter how you try. Bro. Derek did repost stuff today! He must be back and off to study for his tests. I hope that he looked at the testing schedule before he choose his classes and spaced his tests out well! Good luck to the young brother I hope when his grades come out in June or July they are good! Why is that all you brethren have forgotten your oaths and are acting like children in a school ground. Please grow up. Is there anyone there who can take two parties aside and address what the real issue is. It is about time you all started acting like Masons.